We hope your new year is off to a great start! Ours certainly is! We've got a lot of exciting news to share, some of which you may have already seen on Facebook if you've 'liked' us there (and if you haven't, why haven't you?? :) ). First, we're extremely excited to announce that we will be releasing a new live CD in late April! It was recorded at the 2017 Surf Guitar 101 Convention in Torrence, CA by Mark Linett, the three-time Grammy-winning producer and engineer who has worked with the Beach Boys, Brian Wilson, Red Hot Chili Peppers, Jane's Addiction, Los Lobos, Frank Zappa, and many others. Mark also mixed the album, which will feature John Blair and Jonpaul Balak guesting on three songs and a tracklist focused on the "Ancient Winds" album. We feel like we really captured lightning in the bottle with this set and cannot wait to make it available to you all! Second, there is also a compilation album in the works featuring live recordings of the bands that played the 2017 Surf Guitar 101 Convention! More info on this to follow, but this is going to be one amazing album! Third, we already have many live appearances scheduled for this year, including two high-profile ones: First, The Hukilau in Fort Lauderdale, FL, the second-largest exotica & tiki festival in the US, on June 7th & 8th, where we'll be playing with Los Straitjackets, Martian Denny Orchestra, The Exotics, and many others! This is a full-on three-day party, and we're thrilled to be part of it for the first time! Second, on August 18th we will play the incredible Asbury Park Surf Music Festival in New Jersey, held on the beach! Vincent Minervino has been working very hard for the past several years to turn this into one of the greatest surf music festivals in the world, with an attendance of 1000+ last year! 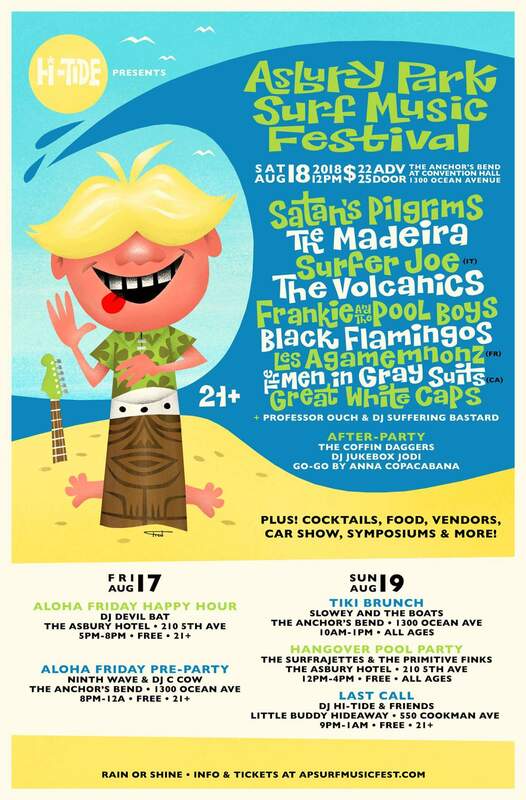 And we'll be playing with an unbelievable list of surf bands, including our friends Satan's Pilgrims, Surfer Joe, Frankie & the Pool Boys, the Coffin Daggers and Vincent's own fantastic band Black Flamingos! This is going to be a surf party for the ages! Prior to these two epic shows, we're very happy to have a chance to play a handful of shows much closer to home in April and May, including the live CD release show at our home-away-from-home, Melody Inn in Indy, on April 20th, followed by shows in Bloomington, IN, Cincinnati, OH (actually Newport, KY) and even Kalamazoo, MI! We have some other shows in the works at the moment, so please keep an eye on our Gigs page and like us on Facebook, if you haven't yet, to get all the up-to-date info. Finally, Ivan's former band the Space Cossacks have just announced that they will be reuniting (for only the third time since 2000) to play the Surfer Joe Festival in Livorno, Italy on June 23rd, followed by a short European tour. For more details, please visit their Facebook page. 2018 is shaping up to be one of the record books! We hope to see many of you at our upcoming shows! Stay tuned for more info about the live CD and the upcoming comp. Wishing you a wonderful year ahead, and hope we all get through the winter unscathed - just six more weeks!